It's hard to believe that August has already come to and end and we are entering into September. August provided us with an excellent month of fishing, we had a mixed bag of conditions but overall fishing remained very productive and this past week was no different. The last two weeks of August has some of the best dry fly fishing of the season, water temperatures are perfect and our pools are loaded with salmon, both older ones and fresh fall run fish. We had an excellent week at both our lodges with plenty of big fish landed and many others lost and missed. The Bonaventure and Petite Cascapedia are seeing an excellent run of late season salmon. The Grand Cascapedia has been on fire this past week. Water conditions on all our rivers are great at the moment. The weather man is calling for rain on Monday and Tuesday, combined with the new moon and high tides next week should be great. 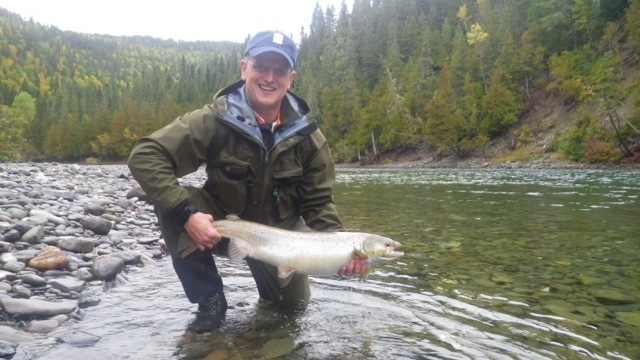 Mike Widmer with his first Canadian Atlantic salmon, this fish may have been in the river for a couple of months but it's sure a fine way to start! We are really beginning to use our fall patterns, the Red Francis, Alley Shrimp and General Practitioner. Dry's continue to be responsible for most of the fish landed. Brown, Green and Blue Bombers. 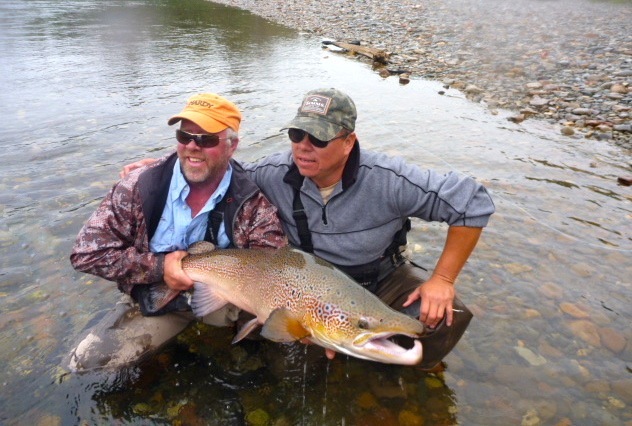 Salmon Lodge Guides Larry and Josh with a colorful fall salmon. September is one of our best months and we are really looking forward to it. Bruno Mueller with his first Grand Cascapedia Salmon, a good start Bruno! If you are interested in fishing with us next season and haven't already booked your place, its time to do it now. We have a couple of prime places available but they are going quickly.